When making meals for the family, substituting meat-based favorites (like spaghetti and meat balls with spaghetti and falafel or using soy cheese or nutritional yeast instead of cheese to make macaroni and cheese for vegans) lets children enjoy these foods in a different way. In many cultures around the world, vegetarian food is an integral part of the cuisine. Experimenting with different foods adds variety and flavor to daily meals. The other day my 4-year old daughter asked me what was for dinner and I told her it was going to be lentils, quinoa, yogurt and grapes. She looks at me and says ‘how are we going to get our vegetables?’. This made me realize that children are creatures of habit. If we give them healthy meals (which are appealing visually and taste-wise), they will anticipate and want to eat those type of meals. Here are some meal ideas that I use to make meals for my family; the recipes of some of the lesser known dishes can be found below in the appendix of recipes. The vegetables, fruits, grains, beans and dairy in these meal ideas can be substituted, added to and removed from, so feel free to experiment! I do bake a lot of my dishes because baking takes lesser oil, and is easier for me as I do not have to constantly keep an eye on the dish that is being baked unlike cooking, though baking takes a bit longer. Most of the recipes requiring baking can be cooked on stove top too. Try cooking at home. As parents, cooking at home allows us to control what goes into the food we feed our family (like amount of oil, salt, spices). Also, using fresh, seasonal produce to cook meals enhances their taste and visual appeal. Keep it simple – explore quick and easy recipes and create your own using few ingredients. Plan ahead – making weekly meal plans and shopping ahead to stock up on perishables (fruits and vegetables) and non-perishables (like grains, beans, pasta, flour, spices, condiments) helps save time and energy. Also, pre-preparation like soaking and cooking beans, washing and chopping vegetables helps save on time. Buying pre-washed and pre-cut or frozen vegetables and fruits is another option. Include variety – different colored fruits and vegetables, different types of beans, grains not only make it more interesting but also lessen the risk of getting nutritional deficiencies. Buy local and seasonal produce as they are fresh and the nutrients therein are at their peak. Getting kids involved in (age-appropriate) pre-preparation and preparation of meals helps make the food more appealing. Also, involving children picking fruits, vegetables and herbs from the garden, Farmers’ Market or grocery store piques their interest in them. One way to get children excited about a meal is to let them help with setting the table and serving some of the dishes. Children, being keen observers, learn a lot from their parents’ eating habits; so setting a healthy example is important. Mock meats have a texture similar to their meat counterparts and are good as occasional treats as they are highly processed foods made from wheat gluten or textured soy protein. Eating with family members makes for conversation, bonding and (hopefully) better acceptance of unfamiliar foods as children watch other members of the family relish those foods. Water and other fluids need to be replenished in the diet. A glass of water served along with a meal reminds children to sip and rehydrate! Treats like cakes, cookies, candy, fried foods are just that and children can enjoy these occasionally. Egg substitutes – mashed bananas, apple sauce, flax seed powder, yogurt, silken tofu are good substitutes for eggs depending on the other ingredients in the recipe. – Mix together all the ingredients and keep in refrigerator until meal time. 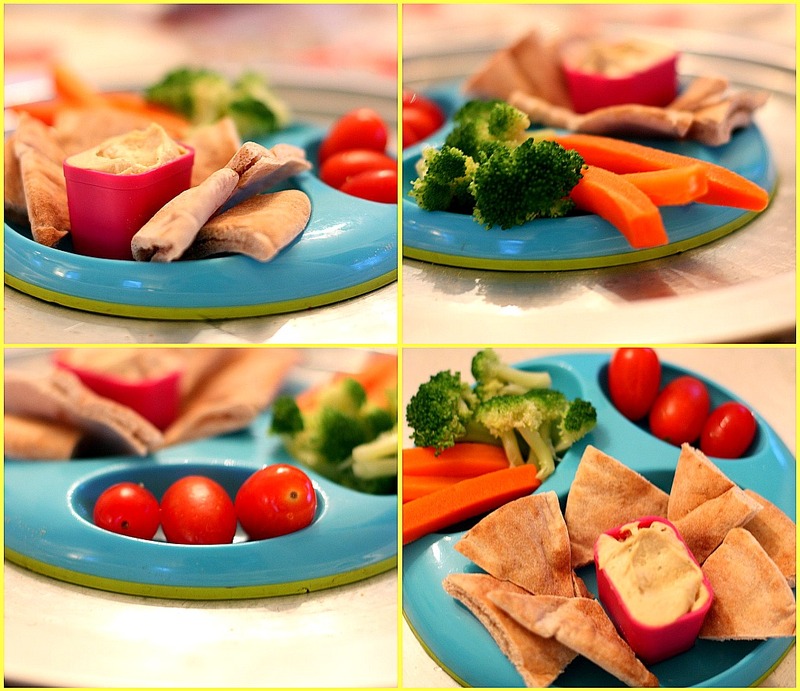 – For serving, cut pita pockets into 2 halves and fill them with the salad. Enjoy! – Whisk together all the ingredients with a whisk and refrigerate. – Wash and cut sweet potatoes into wedges or sticks. Pour oil and mix to coat the sticks. – Spread the potatoes in a single layer on a baking sheet and sprinkle salt (optional). – Bake at 400 0F, turning over the potatoes once until golden brown (30 to 45 minutes). This recipe has many ingredients, which take some time to assemble, but it is easy to make and tasty too. I use a pressure cooker to make this dish and it takes about 15 minutes on medium heat to cook. – Heat ghee or oil in a pressure cooker or a heavy bottomed pan. – Add the whole spices, cumin seeds, crushed ginger and garlic, turmeric, carrots and greens and stir for 2 minutes. – Add rest of the ingredients including 4 cups of water. Cover and cook until lentils and rice are cooked through. Serve hot with cucumber yogurt. – To make cucumber yogurt, wash and grate cucumbers (2 small cucumbers for 1 cup yogurt). Dry roast some cumin seeds until they are browned and aromatic. Add the cucumbers, roasted cumin, salt, chopped cilantro, and chopped jalapenos (optional for children) to 1 cup plain yogurt and serve with the khichree. Sometimes I also add chopped onions and tomatoes to this yogurt. Upma is easy and quick to make and is made using different grains in India. For this recipe, wash and cook the quinoa as per instructions. Heat some coconut (or any other) oil. Add mustard seed, chili flakes, cumin seeds, asafetida and turmeric once the oil is hot. Add chopped finely chopped or grated fresh ginger and vegetables of your choice and sauté until done– I usually add potatoes, carrots, green beans, onions, peas, and corn. Add the quinoa and salt to the vegetables and the upma is ready to eat as is or with beet yogurt. To make beet yogurt, wash, boil and grate beets (1 small beet for 1 cup yogurt). Add the beets, salt, chopped cilantro, and chopped jalapenos (optional for children) to 1 cup plain yogurt and serve with the upma. – Sauté mushrooms in oil until they are slightly brown. Add the onions, bellpeppers, seasoning and paneer. Cook for 5 to 7 minutes. – Remove from heat and add salt, lemon juice to taste, and coriander leaves. – Place some paneer mixture in each tortilla, wrap and eat!. For the noodles, try adding different combinations of vegetables to make it colorful. I make tofu stir fry using tofu, scallions, garlic, red and green bell peppers, soy sauce, tomato sauce (for extra tang), a thickener (nut butters, coconut milk or corn flour). There are many variations of the dosa in India which are all delicious. Feel free to explore different ratios and combinations of gains and beans. This recipe requires some preparation and ingredients need to be soaked 2 days before the day you want to make it. But it is totally worth the wait! – Wash and soak all the ingredients for 8 to 12 hours. Drain the water. – Grind the mixture with enough water to get a smooth, cake batter-like consistency. – Add salt to the batter. Cover and place the covered batter in a warm place overnight. The batter will rise the next day which is an indicator that it is fermented and ready to use. – Once batter is ready, use it or refrigerate it (up to 1 week). – For making the dosas, dilute batter to get a thick, pancake-batter-like consistency and pour onto a heated pan; spread the batter and add few drop of oil around the dosa, following the method used to make crepes. For the paranthas, I make a dough that is a bit stiffer than pizza dough with whole wheat flour, spinach puree, salt and some water (if the dough is too dry). I let the dough sit for a few minutes before I roll out and make tortillas with a little olive oil. I mostly buy pre-cut butternut squash from Costco. I love this vegetable but find it a bit tedious to peel and cut it. I roast the squash with a drizzle of olive oil in the oven for 45 minutes at 400 0F. I add garam masala, cumin seeds, fennel seeds, salt, chopped cilantro and dried mango powder (amchur for sourness, found in Indian stores) ; stir and rmove from the oven. For the pomegranate yogurt, mix together ½ cup pomegranate, ¼ cup chopped mint, salt and 1 cup plain yogurt and serve chilled. I use pita bread as the base for these quick and delicious pizzas. I also bake some roasted vegetables (mushrooms, eggplant, zucchini, asparagus, onions, and cherry tomatoes, drizzled with olive oil and sprinkled with salt, pepper and dried herbs) which can be used as a topping, apart from pineapple pieces, olives, sliced tomatoes, cheese, marinara sauce, pesto, corn, avocado and jalapenos. I blend together chunks of pineapple (frozen), papaya (frozen), mango (frozen) and bananas for the tropical smoothie. – Roast the ingredients for the powder except the cumin and coriander seeds till the dals are golden brown. Add cumin and coriander seeds and roast until they are aromatic. Cool and grind to a coarse powder. – Wash and cook the basmati rice as per instructions. Once cooked and cooled, fluff the rice with a fork. – Wash and cut eggplants into 2 inch long pieces. Heat oil in a pan and sauté the eggplants till cooked through. Alternatively, roast the eggplants in the oven till done. – To assemble the rice, add the eggplants and legume powder to the rice and mix to get a uniform mixture. For the spiced carrot yogurt, I steam and mash some carrots, and add plain yogurt, salt, paprika, roasted cumin seeds, cilantro and coarsely ground roasted peanuts to he carrots. These sandwiches not only look cute but also taste good. – To 1 portion of cream cheese, add beets, salt and pepper to taste. – To the second portion, add grated carrots or apples, salt and pepper. – Add the spinach and herbs to the third portion along with salt and pepper. – To proceed, slather each of the 3 slices of bread with a different colored spread. – Place these slices one on top of another, and place the 4th slice on top to cover the third slice. – Cut the sandwich into 4 triangles and serve. Okra fingers: These fingers are tasty and fun to make and eat, and will make 3 servings. – Wash and dry the okras. Make a slit along the length of each okra. – Preheat oven to 425 0F. – Mix together the flours, spices and salt. Stuff half the mixture into the okras. – Pour oil onto okras and toss to coat uniformly. Sprinkle the rest of the mixture onto the okras and toss until all the okras are coated. – Bake in the oven for 25 to 30 minutes, flipping over the okras once. I make this stew using oil, mustard seeds, cumin, turmeric, garlic, ginger, green chilies, tomatoes, onions, mung beans, salt, cilantro and lemon juice. Mung beans cook quicker than other beans. To sprout them, I wash and soak the beans overnight, drain the beans into a colander in the morning and let them sit for another 24 hours before I use them. To make the baked cauliflower, I marinade cauliflower florets in some yogurt mixed with minced garlic, salt, and paprika for 30 minutes. Then I bake the cauliflower for 45 minutes in the oven at 425 0F, tossing it once in between. Eggs can be substituted by tofu in this recipe, and vegetables like peppers, spinach, scallions, mushrooms and others can be added to the scramble. I make and freeze these burger patties for use later. To make the patties I mix together hand-mashed pinto beans, instant unsweetened oatmeal, salt, taco seasoning, and finely chopped or grated vegetables like onions, broccoli, carrots and peppers. I make small patties with this mixture, bake the patties for 30 minutes in a preheated oven at 425 0F flipping them over once. Once cooled, I store these patties in the freezer to use. I slice some cucumbers, onions, tomatoes and lettuce, toast the mini burger buns, heat the patties, put some hummus on the table, and everyone gets to assemble their own burgers! For the spaghetti squash dessert (which is my favorite) I cut the squash into 2 halves and bake them for 30-40 minutes at 400 0F. Once baked and cooled, I scoop out the squash with a fork and toss in some slivered almonds, raisins, maple syrup and a teeny bit of butter and bake it again for 10-15 minutes. This savory French toast recipe was one of my childhood favorites. Enjoy! – Mix together flours, salt and paprika. Add milk or water to the flour mixture to get a pancake-batter-like consistency. – Add the vegetables and herbs. – Heat a pan. Dip each slice of bread into the batter to coat the bread on all sides. – Place bread on pan, add few drops of oil and cook until golden brown. Flip the bread and cook until the other side is also browned. – To serve, cut each slice into 4 ‘fingers’. Serve as is or with marinara or tomato sauce. These are all lovely ideas, thank you for sharing them!